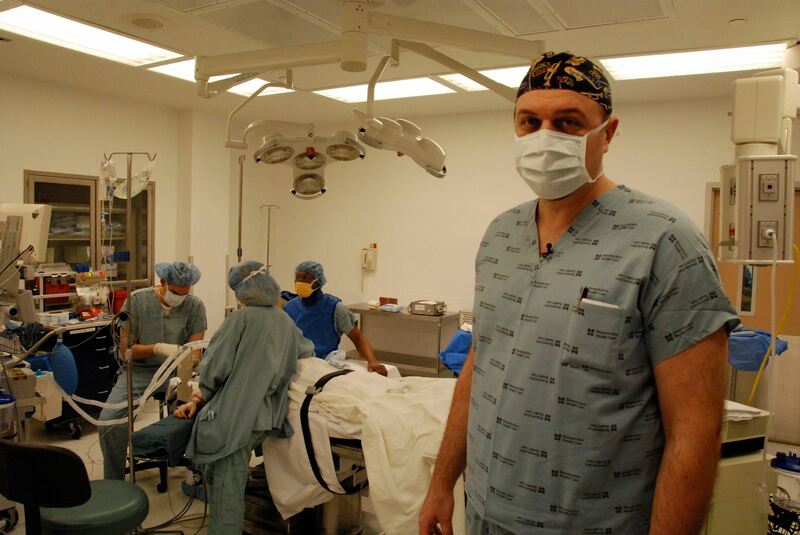 Dr. Daniel Ivankovich was featured on "CNN Heroes" for not-for-profit work around Chicago. ANDERSONVILLE — Standing just a few inches shy of seven feet tall, Dr. Daniel Ivankovich is accustomed to being the center of attention. In light of his recent headline-grabbing work, he's adjusting to being the topic of conversation in every room he walks into, too. The orthopedic surgeon and his work have been celebrated in his field for years, but he was recently spotlit in a more public space: on "CNN Heroes," a series that celebrates "everyday people changing the world," in July for his nonprofit work. He's no stranger to attention — in 2010, he was also named a Chicagoan of the Year by Chicago Magazine. On a typical Sunday morning, the giant frame that made Ivankovich a highly recruited basketball player in high school ducks through doorways as he lumbers through the winding hallways of Methodist Hospital, 5025 N. Paulina St. This is where he feels most comfortable, interacting with patients. He does double duty as an educator to his patients, many of whom are unfamiliar with preventive measures for injuries that could help them avoid costly treatments in the future. When Ivankovich and his wife Dr. Karla Ivankovich, née Carwile, saw how hard it was for patients to get basic health services they founded OnePatient, Global Health Initiative, a not-for-profit organization designed to establish sustainable programs of outreach, prevention and patient education at multiple locations throughout the disparate areas of Chicago as well as Haiti, according to their website. "What really drove me was [my time at] Cook County Hospital. I don’t really know what it’s like today, but the same patients I was seeing when I was an intern were still waiting for surgery when I was a chief resident. They had waiting lists of almost five years. Hundreds of patients that were basically being ignored for whatever reason. it just didn’t seem very appropriate for me. And 95% of them were African-American and the issue was they were very loyal to the Cook County system." Recently, the medical director of One Patient, a not-for-profit focused on treating patients regardless of their ability to pay, has been booked solid, his wife said. Ivankovich says he doesn't mind the hours. Sacrificing his time is a small price for him to pay to make sure people who may not be able to afford medical care can get the same treatment as people who can — something he believes everyone is entitled to. "My job, or my focus, is really about people that are uninsured...When a patient walks into any doctor’s office and says 'hey, I have a Blue Cross PPO' they’re not going to leave the office that day without getting signed up for something. But if they say 'I’ve got the Blue Cross Medicaid HMO' they’re not going to get an appointment," he said. Before medical school, Ivankovich was a force on the basketball court. He graduated high school just days after turning 17, a highly recruited basketball player, and settled at Northwestern University, he said. But his time as a young basketball star in Chicago had exposed to much different parts of the city, he said, teaching him a different set of lessons. "As a basketball player, I was usually the only white guy. I went through all these [different] areas playing in all-star and all-American games," Ivankovich said. "We practiced down on 83rd, down in Avalon Park. I would go down to see a lot of my teammates that lived in Cabrini-Green, Ida Wells, Robert Taylor. I would go pick them up all the time. Going through all the craziness of broken elevators and having to run up 14 flights of stairs in the middle of the summer, I got a pretty good understanding of what disparity was." That disparity haunted him as student at Northwestern University, where he felt he was serving well-off patients and ignoring the underserved, he said. "For me, I always felt like I liked it a lot and I did well, but I never really felt like I fit in," Ivankovich said. "It was on the lakefront. It was Gold Coast. It was in the most posh digs. I just questioned why I was even going into medicine. All these patients that I was taking care of were well-to-do and we never got to touch them as students. It was very much third person learning and I thought this is crazy." When that realization made him question his path to becoming a doctor, music is what saved him. When he was accepted to medical school, the director of the animal laboratories was L.C. Thurman, the owner of the Checkerboard Lounge, an iconic South Side blues club. "He ran the labs, and pretty much I had a standing offer that I would play guitar," he said. "I would go down to the Checkerboard pretty much every Monday and every Tuesday night and all my idols were there. You know, Magic Slim, Junior Wells, Buddy Guy, Lefty Diz, Johnny Dollar. Those guys were there teaching me and I was jamming with them." Ivankovich's passion for guitar started as a youngster growing up in Uptown, where he frequently visited the Kinetic Playground. Diversity was radiating in the music at the nightclub, where he still has vivid memories, he said. "Uptown was very very interesting area back then," Ivankovich said. "The Kinetic Playground was kind of like a psychedelic ballroom on Lawrence and Clark...Hendrix played at the Kinetic playground. A lot of different, very famous acts when through there, so Uptown was immersed in youth and social change." 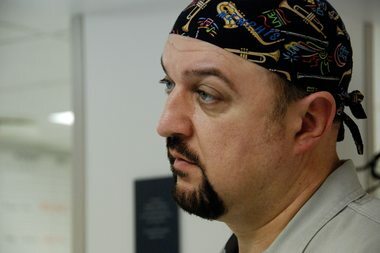 The musical connection kept him in school and he eventually ventured off campus for rotations at the VA hospital and Cook County Hospital. There he found hands-on training at struggling hospitals that had hundreds of patients in desperate need of care and health education, he said. "He goes 'Why? People come into my office begging me to get the hell out of County. You wanna stay there for the entire year?'" That year, 1995, Chicago was hit with a three-day heat wave in July that left 739 people dead. Ivankovich estimated 120-plus hour weeks, which would be "absolutely illegal" these days. Residents aren't allowed to work more than 80 hours now, he said. “That was kind of the beginning. That was kind of like in the Matrix when they you have the choice of the blue pill or the red pill. I just said, 'I’m going to County.'" That summer was far from easy, Ivankovich said. "It was like 100 degrees in the hospital. There was no air conditioning. We were in there running every night, stealing fans from anywhere we could find them trying to keep our patients cool." And yet: "it was definitely one of the best years of my life," he said. On his rare weekends off — his wife Karla says this weekend is his first in months, if not years — Ivankovich still can still be found strumming his guitar around Chicago as Chicago Slim and as a member of the Chicago Blues All-Stars.